Acupuncture is a system of medical therapy used in China for over 2,500 years to treat the entire spectrum of human and veterinary illnesses. It uses small, hair-thin needles to initiate physiologic responses of repair and regulation in the body. Sometimes acupuncture is used as a stand-alone therapy. For many conditions it can be combined with other therapies or medicines. Stimulates the production of the body’s own pain relieving biochemicals, which include endorphins and enkephalins. This makes it very helpful in treating many types of pain conditions, e.g., lower back pain, headaches, arthritis and menstrual cramps. Stimulates the release of serotonin in the brain and body, changes that are measurable in the blood and cerebrospinal fluid and beneficial in treating anxiety, depression and insomnia. Decreases the inflammation that causes many types of pain instead of simply masking the pain. It has a beneficial effect for many types of arthritis, joint and muscle pains. Regulates and improves circulation, benefitting those with Raynaud’s disease, coronary artery disease and hypertension. Decreases and regulates many problems of the esophagus, stomach and intestines such as reflux, indigestion, Irritable Bowel Disease, and chronic constipation. Benefits the reproductive system, easing painful menses, regulating the menstrual cycle, improving uterine circulation and enhancing fertility, labor and delivery. Please visit our FAQ page for additional information on acupuncture. The World Health Organization (WHO) recognizes acupuncture and Chinese Medicine's ability to treat many clinical disorders. The list of treatable conditions was published in a 2003 WHO report. Moxibustion is a unique type of thermal therapy that plays an important part of some treatments in traditional Chinese medicine. 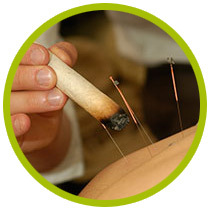 Most frequently used in conjunction with acupuncture, this ancient healing technique involves the burning of Chinese mugwort (Artemesia sinensis), a spongy herb, to warm the needles or acupuncture regions. The faint smoky aroma you may detect in the office comes from this. Acupuncture and moxibustion increase each other's effectiveness when used jointly. The combination of heat and herb stimulates circulation, encourages a smoother flow of blood, and maintains general health. 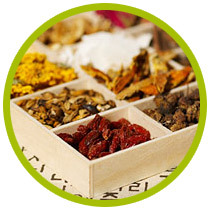 Chinese herbal medicine is a component of traditional Chinese medicine. It employs a holistic approach to understanding normal function and disease processes. Not only used to provide effective treatment for a variety of health disorders, it is also used to help with general health maintenance and disease prevention. By strengthening and improving normal body functions, it boosts the immune system and promotes a general sense of well-being. Most diseases/illnesses display their own basic set of recognizable symptoms, but the actual representation of a specific illness will differ from person to person. Because of this, people with similar health issues may be provided with very different herbal medicine prescriptions. Dr. Burgoon prescribes Chinese herbal formulas that specifically match and treat his patients' individual health problems. As an individual's condition changes and improves with treatment, he adjusts and modifies the herbal treatment until the desired health outcome is achieved. Today, more than 450 substances are commonly used in Chinese herbal medicine, and most are of plant origin. A few common examples are ginger, garlic, cinnamon, chrysanthemum and peony flowers. Many others, of oriental extraction, will not be familiar to most. Dr. Burgoon prescribes herbal medicines where they can be helpful for an individual patient. Unlike modern pharmaceuticals that contain single, isolated agents, herbal medicines contain many biologically active ingredients in small amounts. They can be beneficial for a number of conditions. While they can be used together with many modern medicines, there are some modern pharmaceuticals that should not be mixed with certain herbal medicines. Be sure to let Dr. Burgoon know all of the medicines you are taking, including over the counter medicines and supplements or herbs.